There are a lot of things a person can do with $100,000, should that person be fortunate enough to have $100,000 at their disposal. They could use it as a huge downpayment on a house, put a kid through college with one transaction, or, if we’re being truly practical, buy a set of used Bugatti Veyron wheels. Sites like Motor1 and The Drive found this set of lightly worn Veyron wheels on eBay recently, listed for a Buy It Now price of $100,000 by a seller called “genuinewheel,” which is certainly where all of the world’s $1-million supercar owners buy their wheels. Even if the seller is a bit unorthodox, though, the pricing fits right in with the general costs of Bugatti ownership—you know, the $42,000 turbocharger replacements or the $23,000 in labor charges on replacing a $20,000 fuel tank. If you’re feeling sensible and know you won’t use a Veyron enough to warrant all of the costs, of course, you can always rent one for $20,000 per day when you feel like it. But these are just everyday expenses, really, like going to the grocery store or flying to a remote island on the private jet for the weekend. On the topic of everyday expenses, the wheel listing says the set has authentic, factory-spec rims and Michelin tires with 85 percent left, and that the $100,000 price tag is a bargain, since the seller claims in the listing that Bugatti charges $150,000 for them new. The tires and prices aren’t listed online to confirm that, but a Motor Trend story from 2013 had the rims and wheels estimated at $111,000 per set. And, as of reports like this Automobile one from 2012, Michelin only guaranteed them for 15 minutes at 250 mph, which is just under the Veyron’s top speed with a limiter. 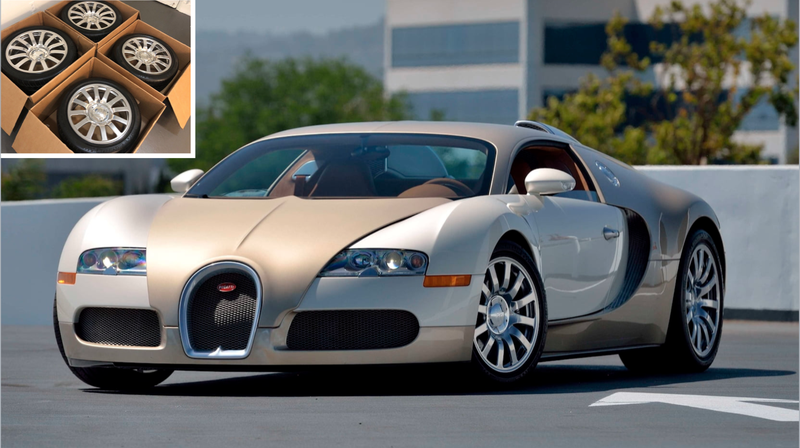 When asked if the $150,000 figure is accurate and whether anyone might be able to tell from the photos if the wheels are authentic, a Bugatti spokesperson told Jalonik they couldn’t comment on either. We’ve also reached out to Michelin to ask the same thing, and we’ll update this story if we hear back. But, if they are real, a $50,000 discount barely used tires is about as practical as Bugatti ownership comes. It’s more than enough to cover the next turbocharger replacement, after all.